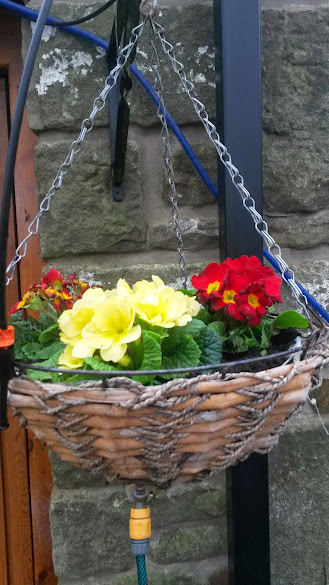 The hanging basket on the garage was looking very dead and sorry for its self so I thought I would get some new plants to brighten it up. 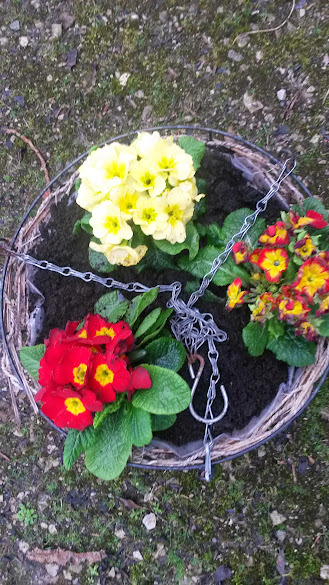 I spotted these primulas when I was out yesterday morning and thought they would be perfect to put in a hanging basket. At £2 for 3 plants they were a bargain. I left them by the front door last night and unfortunately it was very windy so the red and yellow primula has been a bit battered but the other two survived a lot better. It will soon perk up now it has been re potted in the basket.